Want to do something in Penygraig that hasn’t been done before? Want to be part of a series of one-off community photographs? Want to get free digital prints of the results – yours forever?! 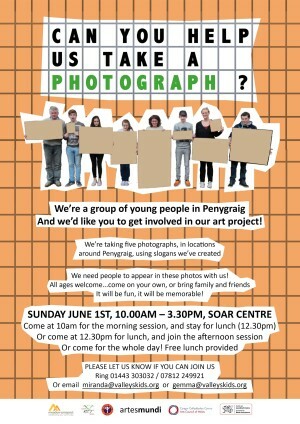 Then come along to our PENYGRAIG PHOTO DAY! 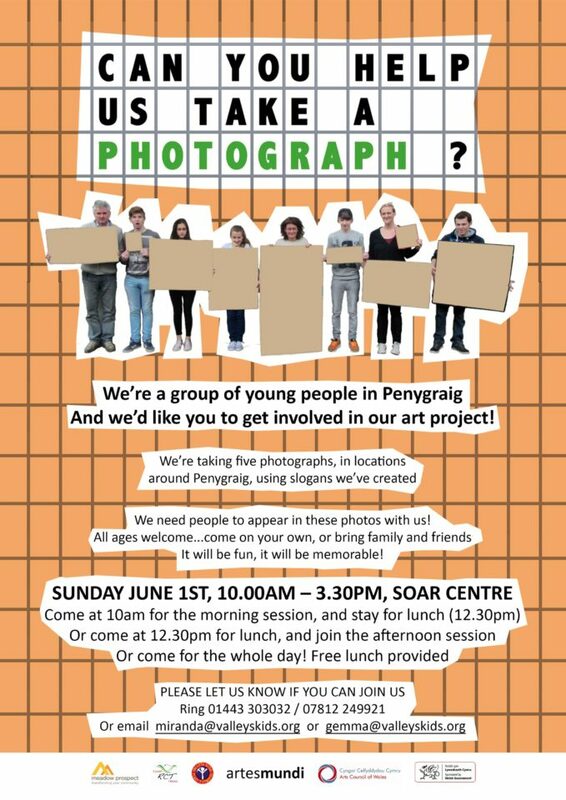 And be part of an extraordinary set of photos, the likes of which won’t have been taken part in Penygraig before! So what’s behind it all…? Well, a group of young people have been working with an artist for the last 6 weeks exploring ideas around regeneration, and the local area. 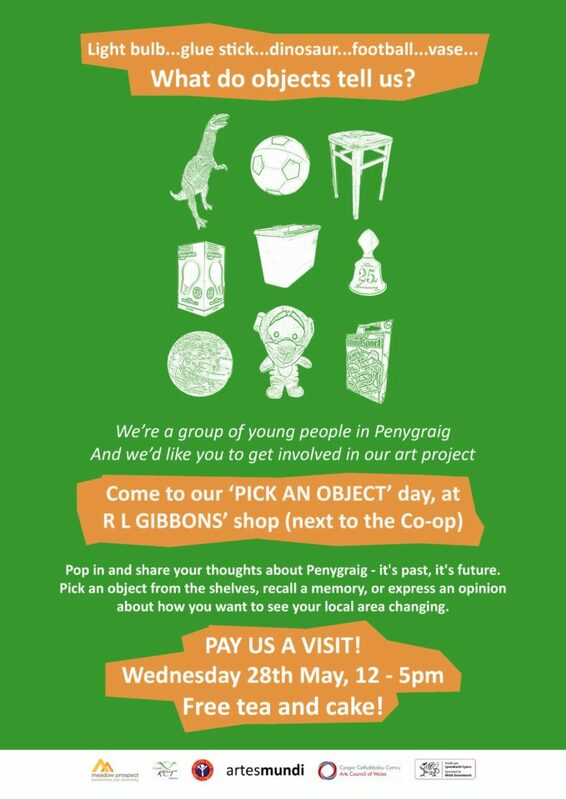 This coming week the group are hosting a series of events to involve you in the project! There are five photos in all. And we’re taking them in different parts of Penygraig, all within 5 minutes walk from each other. On Thursday 29th, if you turn up in the main street in Penygraig, you’ll see us in a shop on the corner, and there you can vote for which slogans you’d like to see in the photographs. And at the end of it all, we’ll send you a set of beautiful professional digital photos you can keep! Everyone’s welcome, the more the merrier. PLEASE JOIN US, WE CAN’T TAKE THESE PHOTOS WITHOUT YOU! Meet at the Soar Centre, 10am prompt, Sunday June 1st. We’ll explain all on the day! According to the European Union website*, “Europe Day (9 May) celebrates peace and unity in Europe. The date marks the anniversary of the historical ‘Schuman declaration‘. At a speech in Paris in 1950, the French foreign minister, Robert Schuman, set out his idea for a new form of political cooperation in Europe, which would make war between Europe’s nations unthinkable. His vision was to create a European institution that would pool and manage coal and steel production. A treaty creating such a body was signed just under a year later. Schuman’s proposal is considered to be the beginning of what is now the European Union”. At the Community Enterprise Network (CEN) we are celebrating this day because the CEN is an Economic Development project, backed by the European Regional Development Fund through the Welsh Government, which aims to forge an enterprising culture and raise prosperity in the Bridgend, Merthyr Tydfil and Rhondda Cynon Taff areas.